Drs Jan Fridén, Andreas Gohritz and Carina Reinholdt at the university hospitals of Gothenburg and Hannover, have initiated a surgical treatment project using healthy donor nerves to reinnervate paralyzed muscles in tetraplegia. 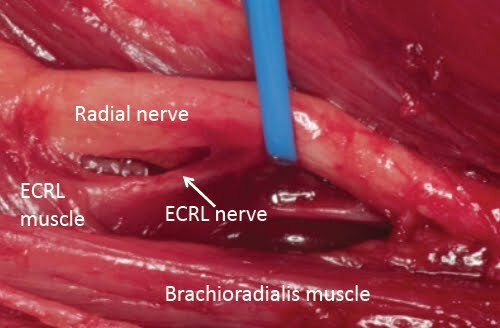 Multiple operations are planned and the first already undertaken to restore wrist extension by transfer of elbow flexor muscle motor nerve branch to one of the wrist extensors (ECRL, picture left). These operations are preceded by careful mapping of optimal choice of available donor nerves, biomechanical muscle properties and anatomical feasibility. Donor and recipient nerves have been selected so that nerve grafts can be avoided. If this treatment meet expectations, persons with high spinal cord injuries and tetraplegia (C5) and with no remaining forearm and hand muscle functions may have a new concept of reconstruction of hand control available shortly.